A prowler spotted outside Madeleine McCann's holiday apartment was yesterday revealed as a new prime suspect in the hunt for the missing girl. The heavily scarred stranger was seen five times in the four days before the three-year-old disappeared, prompting fears he could have been watching the McCann family. Although he was seen by four witnesses, each of whom gave statements to Portuguese police, astonishingly it has taken almost two years for their accounts to be linked. The suspect is one of a series of developments which have given Kate and Gerry McCann fresh hope that they could finally be closer to finding their daughter. But their hopes will be tempered today as they came under attack yet again by the former Portuguese police detective in charge of the investigation. 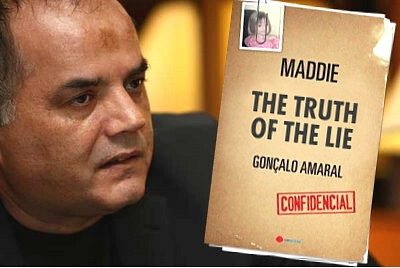 Gonçalo Amaral accused Kate and Gerry McCann of a sinister cover-up as he plugged his book on the investigation in Paris today. He said the couple’s statements all contradicted each other, and that Kate McCann’s fingerprints had been found on the open window through which her daughter had allegedly been taken. Amaral, who is now retired, said justice was never done because the case became a ‘political rather than a police one’ in Britain. 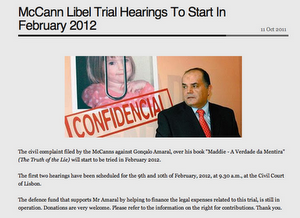 In an interview with Le Parisien newspaper published in the French capital, Amaral said: ‘We constantly noted the contradictions in the statements of the McCanns and their friends.